Finishing a malt in a different cask than the one it has spent most its maturing life in is a practice which is becoming more and more common. Of course, I’m not telling you anything new and you’ll also be aware that the use of exotic and unusual casks for finishing purposes is becoming more and more controversial among malt aficionados. On the one hand are the arguments that using exotic finishing casks are a marketing gimmick and a way to spice up what is otherwise a malt of mediocre quality. On the other hand, if the process results in an enjoyable dram in your glass, then what’s the problem? I will come off the fence straight away and state that what counts for me is what is in my glass. If I really enjoy malt X finished in casks which have contained Y, then I don’t care that malt X was mediocre to begin with or that the use of cask Y was purely done to put a unique product on the market. This argument will probably run and run. What I want to tell you about in this e-pistle is that I recently had the opportunity to see the argument from the other side: how do wine buffs regard the use of ‘their’ beverage of choice to enhance another alcoholic drink? Let me first explain how I got to be in this situation. 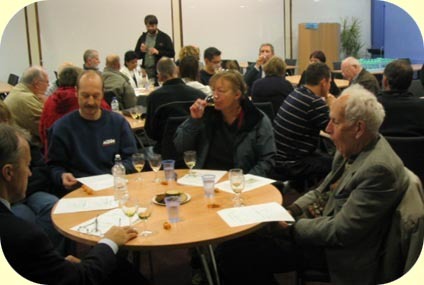 Shortly after I started my new job in the School of Biological Sciences at the University of Southampton, I joined the university’s wine tasting club. Once a month there is a themed wine tasting, and the atmosphere couldn’t be more relaxed and friendly. During a truly fabulous tasting of a range of clarets, Guy, who was running this particular tasting (and also happens to be my group leader), mentioned that some of the casks that have been used to mature the claret get shipped off to Scotland, “as they’re then still good enough for maturing whisky”. As Guy said that, he winked at me, as he knew that I was very much into whisky …. But Guy’s statement triggered an idea with me, and to make a long story short, it was agreed with Hugh, who basically runs the wine club, that I would host a tasting of malt whiskies finished or matured in wine casks. Besides this being the first time I would host an official whisky tasting, it would give also me an opportunity to see how wine lovers see ‘wineskies’! And we’re talking actual wine here, not fortified wine such as port, sherry or madeira. On top of that, I wanted to bring in an element of blind tasting, so people would have to taste and think a bit. And stay within the budget Hugh gave me, of course! First pair consisted of the Glen Moray NAS ‘Chardonnay’ (40%, OB) and the Glenmorangie NAS ‘Burgundy’ (43%, OB). Second pair: the Bruichladdich 14yo 1991 ‘Yellow Submarine’ (46%, OB, matured in Rioja casks) versus a Monbazillac-finished ‘Highland’ malt (from an unspecified distillery); ‘Highland’ 13yo 1993 (46%, Jean Donnay’s Celtic Whisky Company). The story as to how this particular Bruichladdich got its name is always a fun one to tell of course! The ‘Highland’ is clearly much sweeter (butterscotch, rum-raisins), with a thicker mouthfeel, than the Bruichladdich which is fruity-spicy and pretty complex. The thick sweetness from the Monbazillac should have given it away, but thinking that, as in the first pair, the darker-coloured malt came from the red wine cask didn’t work out this time (the Bruichladdich is much lighter in colour than the ‘Highland’). About two thirds of people matched malt and wine correctly this time. Finally, the third pair. I wanted to make guessing the type of wine cask really hard this time, so I chose two pretty peated malts. We put the Bowmore NAS ‘Dusk’ (50%, OB, Finished in a Claret cask) and the Longrow 10yo 1995 (55.6%, OB, Finished in Tokaji wood). I also wanted to add an extra element of guessing for this last pair, so decided not to give away the fact that the white wine in this pairing was Tokaji, but just referred to it as a ‘Mystery White’. With one of the bottles I ordered for this tasting came a courtesy copy of Jim Murray’s Whisky Bible, so the first person to get the ‘Mystery White’ right would win this. Around the peat of Bowmore are more flowery notes (plus some FWP, the problem clearly hasn’t left the system completely yet) and the finish is relatively dry. In contrast, the Longrow is a wee bit less peaty and has a thicker mouthfeel. The sherry comes through from the primary maturation and it is a touch sweeter than the Bowmore. For someone not used to tasting whisky this certainly was the hardest pair to call and, indeed, only about 50% got the malt-wine matching right (so overall not better than random). After several wrong guesses from the group (Sauternes wasn’t a bad guess) as to the identity of the ‘Mystery White’, Hugh himself was the first one to shout out ‘Tokaji!’. He seemed quite pleased with his wee price and as he was the one who allowed me to do this tasting in the first place, a worthy winner as far as I’m concerned! We usually round off a wine tasting by asking for a show of hands at the end, indicating which of the wines served that night was your favourite. No reason not to stick to tradition just because we’ve tasted whiskies rather than wines. I didn’t count the hands, but the Monbazillac-finished ‘Highland’ and the Tokaji Wood Longrow seemed to have been pretty much the joint favourites. So how do wine buffs regard wine-finished whiskies? On purpose, I didn’t talk about the controversy that ‘wineskies’ are stirring up in the whisky world. The people attending ranged from those who had never tasted malt whiskies before to those knew their basic malts, but for whom wine-finishing was mostly a new thing. While walking around the tables, pouring whiskies, talking to people, I did not hear a single remark suggesting that wine-finished whiskies were regarded as a bad thing. People really enjoyed the evening and the malts on offer and for many the tasting opened their eyes as to how varied in taste malt whiskies can be. It was fun and educational. At the Christmas Dinner a week later, people again told me how much they enjoyed the evening. Several also asked me where to buy specific malts. Enjoyment is what it’s all about with whisky (or any other drink), so getting people to enjoy malt whisky is a positive thing, isn’t it? 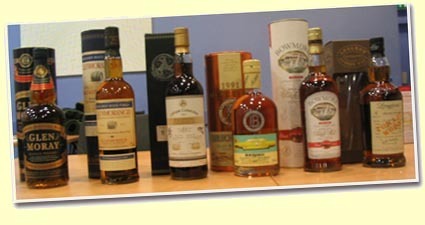 And are you asking whether I enjoyed hosting my first ever official whisky tasting?